America's safest 7-passenger crossover the Ford Taurus X is back for its second year and with its huge array of features it will definitely continue to be a popular family vehicle. 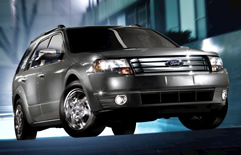 Ford has three available models for the Taurus X - the SEL, Eddie Bauer and the Limited. A number of packages are available to further customize the Taurus X such as the Limited Wood Package, SEL Interior Convenience Package and the SEL Interior Power Package. Standard on all models is three rows of seating with spacious room for up to six - an optional bench for the second row allows for seven occupants. Depending on the model and trim level the seats will range from cloth trimmed to leather trimmed. Available on the SEL and standard on the Eddie Bauer and Limited models is heated first row seats. If extra cargo room is needed the second and third seating rows fold flat and create an amazing 85.2 cubic feet of storage room behind the first row seats. For entertainment on those long drives a rear seat DVD Family Entertainment System is available. Optional on the SEL and Standard on the Eddie Bauer and Limited Taurus X models is Ford's SYNC in-car voice-activated communications and entertainment system. All models feature the classy Ford 3-bar chrome grille.fog lights, sparkle silver roof rails, solar-tinted glass and privacy glass on the 2nd and 3rd seating rows. The color of the cladding varies depending on which model is chosen - they are painted Silver Eclipse on the SEL, Pueblo Gold on the Eddie Bauer and are body-color painted on the Limited. Under the hood of all 2009 Taurus X models you will find the same 3.5 Liter V6 engine coupled with a six-speed automatic transmission capable of 263 horsepower and 249 lb.ft. of torque. Front wheel drive is standard with all-wheel drive available to all models. AdvanceTrac Electronic Stability Control and Power 4-wheel disc anti-lock brake system with brake assist feature are also standard. The Ford Taurus X features a multitude of safety features and achieved a five star crash test rating from the NHTSA. You'll find standard safety features such as Ford's Personal Safety System including dual stage front airbags, sensors to detect driver's seat position and crash severity. Also standard to all models is Front seat side airbags and the Safety Canopy System designed to protect the occupants during a rollover accident, SOS Post Crash Alert which will unlock the doors and activate emergency flasher and the horn if the air bags have been deployed.